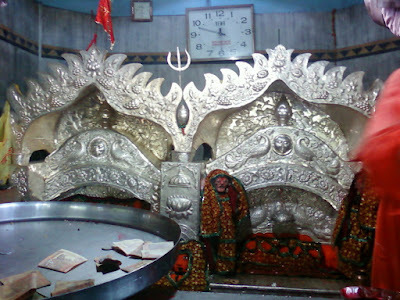 Chandrika Devi temple is a very famous spiritual place in Lucknow where Maa Chandrika Devi is prayed in the ‘Pindis Roop’ (a rock having three Pindis or heads). This temple is dedicated to Hindu Goddess Chandi a form of Hindu Goddess Maa Durga. During the Navratri days, it is very crowded and lots of peoples come here from nearby cities to visit Maa Chandrika Devi. The Chandrika Devi Temple and its nearby areas have very significance religious relevance with Ramayana and are called as Mahi Sagar Teerth. There are details of this temple in the blessed books of Skand and Karma Puran. Temple is approximately 300 years old and it is about 28 km from Lucknow. About 6 km away from the main road on Sitapur Road Chandrika Devi Temple, established between distant forests. The temple site is surrounded by river Gomti from three sides. This place can also be called a small island. 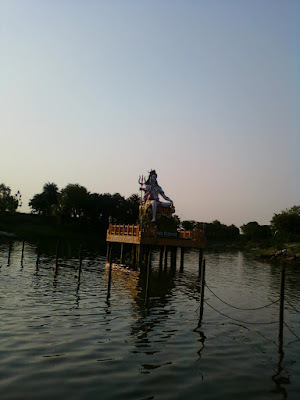 It is also believed that the moon, which was affected by the curse of Dakshaprajapati, had to come to Chandrika Devi Dham to take bath in the water of this Mahisagar Sangam Tirth to take relief from the curse of Dakshaprajapati. In the Treta era, Chandrika Devi Temple history related to Lord Ram’s younger brother Laxman’s elder son Rajkumar Chandraketu. Once he was going with Ashwamegh horse through Gomti River. In the way, it wound up dull or dark and thus he decided to take rest in the very dense forest. Then he prayed to Goddess Durga for his wellbeing. Instantly there was cool moonlight and the Goddess Durga appeared before him for assuring to Rajkumar Chandraketu. After this, the grateful Prince established this temple There was a grand temple which was established at that time was later destroyed by the foreign invaders in the 12th century. In the Mahabharata time, the five Pandavas' son with mother Draupadi came here to this shrine during his exile. Maharaja Yudhishthar performed Ashwamedh Yagya Yajna, whose horse was stopped by the then King Hanshdhwaj. Then near to Chandrika Devi Dham, he had to fight with the army of Yudhisthira, in which his son Surath joined. But the second son Sudhnava was busy in the worship of Goddess Nav Durga. Due to the absence in war, he was treated by putting him into a pan of boiling oil in this Mahisagar area. Due to the grace of Maa Chandrika Devi, there was no effect on his body. From then on, this shrine started to be called Sudhwanva Kunda. The army of Maharaja Yudhishthira lived here, then this village was called Katkavasa. Today this place is called as Kathwara. There is one more legend of the period of Dwaper Yug or Mahabharata time. Lord Shri Krishna advised to Barbreek who was the son of Ghatotkach or grandson of the Bheem for the worship of Maa Chandrika Devi for acquiring powers. So Barbreek worshiped continuously 3 years to Maa Chandrika Devi at this place. As per saying there is no shortage of water in the Mahisagar Sangam Tirtha and it is directly related to the river. Even today, crores of devotees came here for the worship Lord Maharathi Barbarik. Approximately 250 years back some nearby villagers during walking in the forests found this beautiful place and locate the statue of Devi. It is said that near the Gomti River, on the banks of the Mahisagar Sangam Tirtha, there is a very ancient tree of Neem in which Maa Durga with their nine forms and the Vediya kept safe from immemorial time. Later on, the landlord of Kathwara village saw a dream of Maa Chandrika Devi so he decided to build the temple at this place. 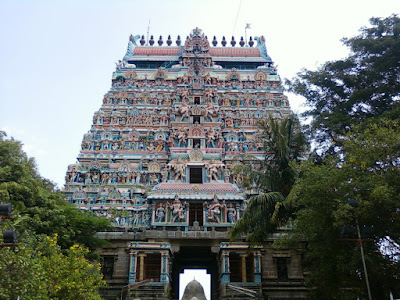 Since then peoples continuously visit this temple and arranged a huge fair on each Amavasya. Every Amawasya and Navratras lots of Maa Chandrika Devi devotees came here from the nearby cities for the various types of religious activities such as Mundan Sanskar (full hair cutting), Janeu Sanskar, Hawan or Yagya etc. During the Navratri days, there is a huge fair organized by the temple and Mela committee so at that time it is very tough to visit Maa Chandrika Devi due there is a very long queue so it is better to go in Morning time for better experience. At that time lots of cultural and religious activities also organized by the committee such as Kirtans, Satsang. Last year in 2017 there was under the Swachh Bharat Mission a cultural activity organized in which very famous singer Malini Awasthi came here to aware peoples about the cleanliness in the people through the singing various beautiful songs of Maa Chandrika Devi in her melodious voice. There are lots of facilities developed by the committee for the devotees. There are lots of shops for taking sweets or dry fruits for offering to Maa Chandrika Devi with other items such as such as Sindoor, churi (bangles) Bindi, Chunri (cloth). There is a facility to take breakfast, lunch, and dinner also. You can purchase here CDs, cassettes, religious books, and other many items. There is also CCTV facility so no one can involve in wrong activities like pocket picking, misbehaving etc. Aarti Time: From 07:00 am in the morning and from 08:00 pm in the evening every day. During Amawasya: From 11:00 pm in summer and from 10:00 pm in winter. Closing Time: Daily in the afternoon from 01:00 pm to 02:00 pm and half an hour before the Aarti starting. Chandrika Devi Temple is situated on the bank of waterway Gomti River at the north-west of National Highway No.24 which popularly called as Lucknow-Sitapur road in Lucknow, in the Katwara town. It is approximately 28km from the main city and 45 km from Lucknow Airport. The distance from the Sitapur road after the Bakshi ka Talab (BKT) where a gate of Chandrika Devi temple is there are only 11 km. You will get easily prepaid Taxi, auto, cab and Buses from the Lucknow railway and bus station. You can go there by private or own vehicles which is a better option, it will be 40 to 45 minutes journey which ends up at the calm and peaceful environment. Quite a sacred and famous place for Hinduism.